Sup chaps and all you aspiring web legends. Right, ModDB is HTML based, so any bigoting or 'ohhh HTML is testes' is completely pointless. There's some rather nifty profiles out there, but I have no idea how some of them are made. Case in point; a lot of mods have a banner/description crossover picture going on, which is pretty awesome. I've done something similar, and made everything to the right dimension but I just can't get it to sit correctly, which is intensely annoying. 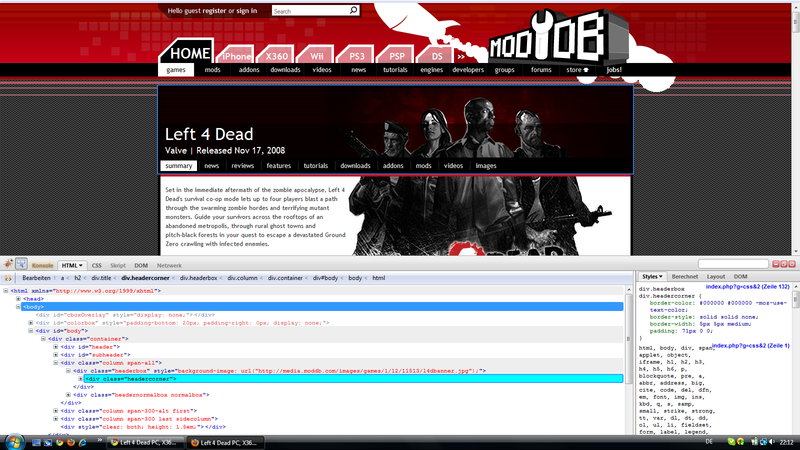 Go check out the L4D ModDB page, it's exactly what I'm after. So, er, little help with that? Very different this, I want to look into setting up a website for Field Zone, my mod. I'm interested in good hosts and cheap prices. The actual design element I should be able to manage myself (to a degree) but mainly I just want to know how and who with you guys rig up your sites. Well if you want to see how things work in html and css directly on the site, I would suggest you to get the Firebug-Plugin for Mozilla Firefox..
Well on the other hand, I'm not sure what you mean exactly with "mods have a banner/description crossover picture going on".. Explain, so I can help probably..
Bekey, no dice. Isn't working. Well this is a background picture sliced in 2 parts packed in 2 div's as a background-image. In the upper div there's a headline and within that the hyperlink. Last edited by Armageddon on Thu Apr 29, 2010 9:12 pm, edited 1 time in total. That is absolutely no help Quero. You aren't really working with html more the css (style sheet) the defines the colours/size/background-images/position of the html entry tags. and would sort of recommend them as their help service can be hit an miss. Also if you wanted to host a forum you would need either the power or unlimited user account. Right, sat with my mate and all his <img src="http://i154.photobucket.com/albums/s257/skelhon/FZbannerlower.png" align="right" style="padding-right: 20px; padding-top: -10px;" /> stuff, and we've pretty much got it. However, I still need hosts. Oh my, someone actually uses streamline? I used them a few years ago and it was shocking. Quero was helpful but if you don't know anything about web stuff then you aren't going to get far unless someone actually does it for you, which is different to asking for help. From looking at the dystopia and left 4 dead pages I'm guessing they somehow have the abilty to define a header image from their profile page. Then once they've inserted that they are using another image within the content area and lining it up. What kind of access to you have from the profile page? Can you define a header image? Can you write HTML into the content area? Ahm.. excuse me, didn't noticed that you're pretty new to the subject. Well at work I prefer One.com for portfolios or blogs and such stuff. I'm not sure how the prizes in the UK differ, but in Germany they're quite cheap and reliable. But if you want to add some kind of board/forum besides a blog for project-management I would consider something else for hosting. I would advice antagonist. Although it's Dutch, it's very cheap (24€ a year (~21 GBP) and reliable. I've first hand experience with a couple of sites I host for people there (personally). "I" also host websites for the company I work for, but that's way more expensive and is more aimed at support. blackfoot.co.uk looks fine too, but is way more expensive and has (way) less features/seize. You know how you can contact me. Blink wrote: Oh my, someone actually uses streamline? I used them a few years ago and it was shocking. yeah they are cheap for a reason but they fit my needs mainly because I am not running something that is very sever intensive. Also they have improved a lot in the last year or so.